A term commonly used to refer to freshwater shrimp, larger sized shrimp, or a smaller variety of shellfish (crustacean) that is a member of the lobster family. Freshwater shrimp are typically harvested after they have moved from saltwater into the freshwater areas. Most often larger in size than saltwater varieties, the prawn will have a longer and narrower body than other shrimp and contain meat that is very similar in texture and taste. 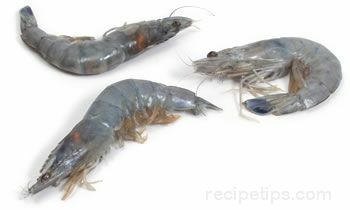 Varieties most often available include the blue prawn or sweet-water prawn from Hawaii, the Caribbean and Brazil, and the spot shrimp or spot prawn from the Pacific waters. When used to refer to larger sized shrimp, the term "prawn" is often associated with varieties of jumbo shrimp. Prawns should be kept alive or frozen and eaten as soon as possible since it does not take long for the meat to break down and become mushy. Removing the heads of shrimp assists to keep them fresher in flavor. Smaller crustaceans that are traditionally known as prawns include Danish lobsters, Norway lobsters, Dublin Bay prawns, Italian scampi, and a variety of different species of Lobsterettes as they are known in the U.S., or Langostino in Spain, and Langoustine in France. Similar in appearance to a 8 inch lobster, this shellfish has an outer shell that ranges from dark to light red in color covering a pure white meat, which is sweet flavored in very delicious tasting.